If you’re looking for longer, thicker hair right now, hair extensions are a great way to gain instant length and volume. Hair extensions are not “one size fits all”, however. In fact, many types of hair extensions can actually cause damage to thin hair, resulting in further hair loss. Keep reading to learn about the best extensions for thin hair, and tips on how to maintain hair extensions for thin hair. Clip-ins – These temporary hair extensions attach to natural hair with a clip. A stylist can install clip-in hair extensions, but they’re also easy to DIY at home. However, the clips are often too heavy for fine or thin hair. Clips may slide out, damage hair, or pull hair out altogether. Weaves – For this type of extension, a stylist tightly braids the natural hair, then sews hair extensions wefts into the braids. Most women with fine or thin hair do not have enough hair to create strong enough braids for this type of hair extension. Fusion – For these hair extensions, the stylist attaches extensions to hair using a keratin bond. Fusion extensions have a long and expensive installation process. The keratin bonds are quite heavy and can damage fine hair, plus the removal process can injure delicate strands even further. Clearly, most hair extensions are not a good option for thin hair. If you have thin hair and want hair extensions, tape-in extensions are probably your best bet. This relatively new type of hair extension is applied by a stylist. The stylist applies two-inch wefts to natural hair using a special hair tape. The hair wefts are thin and lightweight so they cause less strain or damage to hair. The application process is relatively quick, and doesn’t involve harmful tools or chemicals. Tape-in extensions lie flat against the scalp, so you can wear your hair up or down. They last eight to 12 weeks. Select a gentle shampoo and lightweight conditioner that won’t damage extensions. If you need help, your stylist or the extensions manufacturer’s website can guide you. When washing hair, tilt your head back and gently cleanse the scalp with your fingertips. Avoid scrubbing too hard, as this can disrupt the bonds of the tape-in extensions. Apply conditioner from the mid-lengths to the ends of the hair, carefully avoiding the roots. After cleansing, do not rough dry hair with a towel. Instead, gently dab hair with a soft towel or old t-shirt to remove extra moisture. Do not blow-dry hair with excessive heat — keep the heat setting to 50% or below. Longer hair can tangle more easily, so plan on de-tangling your long extensions two or three times per day. Start at the ends and gently work your way towards the roots. Wear hair in a loose braid at night to prevent nighttime tangles. 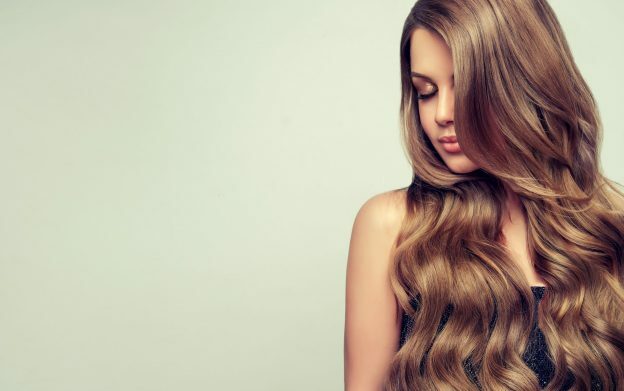 Oil-based hair products can dissolve the bonds of hair extensions, so avoid using them in your hair. So by the time it’s time to take out your tape-in extensions, your hair may be so thick that you may not even need to replace them! Have you ever tried tape-in hair extensions? Let us know in the comments!